Improve the performance and productivity of your people, processes, and technology, working together effectively. People, processes, and technology are a combination of the soft and squishy (human performance and decision-making) and the hard and solid (technology and processes) that need to work in an integrated manner to provide exceptional performance and productivity. JLP Performance Consulting uses its unique P3 approach to integrate this range of hard and soft aspects to assure that all success factors are addressed for success. Our approach reduces the risks that have caused many organizational productivity initiatives to disappoint. Increase likelihood of successful outcomes by improving decisions and planning through developing actionable and relevant decision-making information (decision-driven performance measures, benefit-cost analysis, Project Portfolio Management frameworks, and programmatic risks). 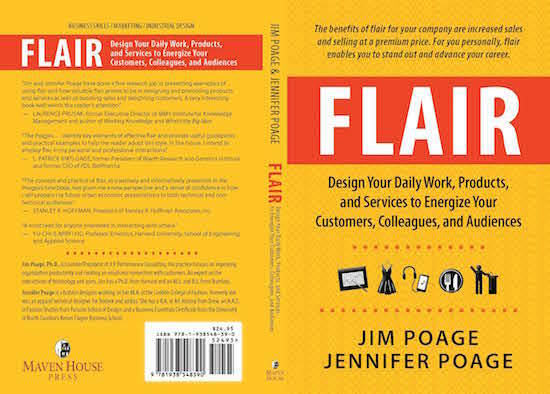 Increase sales and charge premium pricing by adding “flair” to products and services to engage customers emotionally. Use “flair” to enhance reception and acceptance of everyday work. Increase likelihood of successful outcomes by improving participation and buy-in of stakeholders in decisions and formulating actions through facilitation and coaching. Our unique P3 approach delivers a compressive and systematic analysis that brings to light operational and organizational gaps that hamper success while keeping focused on increasing bottom-line benefits. Probe - We’ll probe all aspects of your initiative to reduce risks of failure by comprehensively understanding how the initiative will work. Perspective - We’ll examine the initiative from all viewpoints – workers, managers, suppliers, and even inanimate objects like products or knowledge flowing through your organization – to identify all success factors. Performance - We'll keep the focus on obtaining value. "Jim has a remarkable ability to facilitqate large meetings...to reach consensus. He doesn't force the outcome, but rather surfaces one through systematic analysis and research." Co-author, with Jennifer Poage, of 'FLAIR - Design Your Daily Work, Products, and Services to Energize Your Customers, Colleagues, and Audiences', 2016, Maven House Press. For more information about the book, go to the Publications and Presentations page, or see www.jimpoage.com or go to Amazon or Barnes and Noble.